Summer brings a bounty of juicy peaches. Once you exhaust the options for freezing them, canning them, and turning them into jam and chutney, make homemade peach liqueur your next order of kitchen business. Plan in advance of any special occasion calling for fuzzy navels or peach margaritas; the liqueur needs to age for about a month to develop full flavor. You can also add a splash to a gin and tonic; use it to make a Bellini; give plain ice tea a peachy kick; or turn it into a glaze for meat, poultry, or fish. Label the bottle with the contents and the date you made it. The liqueur retains the best flavor and color for up to a year. After that, you can still safely drink it, but it may begin to lose flavor over time. Oxidation from the bit of air in the bottle is the culprit, and you may even see some separation of the ingredients. Once that happens, it's best to discard the remainder and make another batch. This summery liqueur makes a wonderful gift from the kitchen in a dressy bottle with a hand-lettered label. In a heavy saucepan, boil the sugar and water over medium-high heat, stirring constantly until the sugar dissolves and the syrup turns clear. Remove it from the heat and let it cool to about 110 F, or slightly more than lukewarm. While the syrup cools, cut into the peaches end to end on both sides, then twist the halves in opposite directions to separate the flesh; remove the pits and set them aside for later use. Put the peaches, peach pits, lemon zest, and orange zest in a clean 2-quart glass canning jar. Add the cooled sugar syrup, vodka, brandy, and food coloring. Seal the jar with an airtight lid. Turn the jar top to bottom in one full revolution to gently mix the contents. Store the bottle in a cool, dark place for two weeks. After two weeks, strain out the solids with a fine mesh sieve. Pour the peach liqueur into a clean jar, seal it, and let it stand another two to three weeks in a cool, dark place. Strain the peach liqueur a final time through a double layer of cheesecloth or other filter into a decanter or decorative bottle. Taste your infusion a couple of times as it ages. You may be happy with a more subtle flavor and want to strain it ahead of the recommended two weeks. Neutral-flavored vodka works especially well as the base for an infusion, but feel free to experiment with other spirits, such as gin, rum, or tequila. Generally the lighter-colored, least flavored versions provide the most dependable results. Play with the flavors by adding complementary herbs or spices. 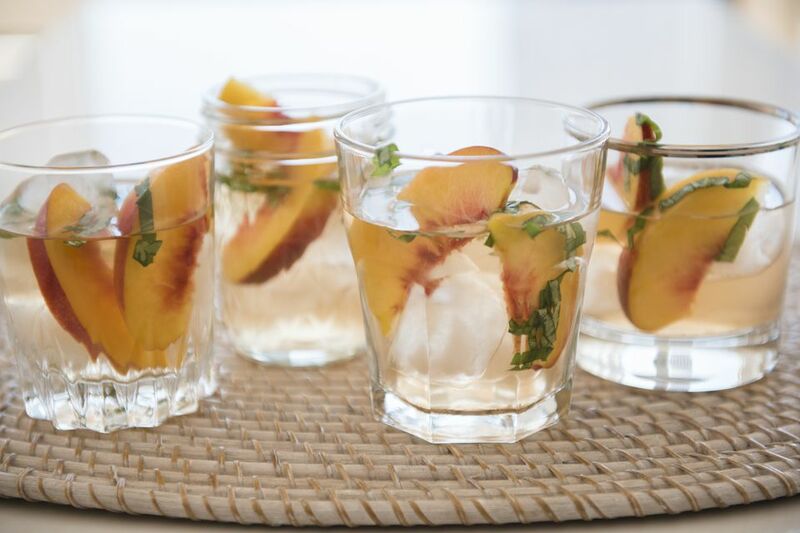 Star anise, thyme, jalapeño, and mint all make good choices with peaches. How Do You Make Nocino (Italian Walnut Liqueur)?